Yes, plenty of cilantro. In all honesty, this was so good that even though it might not have technically been a spot-on Banh Mi, I'm not sure I would want to change it at all. Thanks for the suggestions though, if I can control my inner carnivore, I'll try more salad than meat when I make the red-cooked pork Banh Mi. I'm envious of the folks who can get access to the proper baguettes. Last week I stopped into several bakeries in Chinatown (after having bought a bahn mi with shredded pork) and none of them had baguettes for sale. The folks who sold me the bahn mi told me they buy their bread from a bakery that doesn't sell retail. Maybe if enough of us keep asking at any of our local bakeries, someone will realize that there's a market for them. Id also like to know where they buy the pate etc for those same bahn mi, its the same in two of the shops in Chinatown BOS. David, your pork belly looks fantastic if not traditional. And yes, I have used roast duck purchased in Chinatown for banh mi as well as home made char siu, the red BBQ pork stuff from Chinatown, grilled chicken and grilled shrimp. I have found that buying roast duck necessitates a little labor, since the meat (and some crispy skin) really does need to be pulled off the bones before assembly. I suppose one could make one's own roast or grilled duck breast and solve that problem, but I am far too lazy to do that, and besides, it is easy for me to get to Chinatown Oakland. And I'm guessing it's cheaper than purchasing raw duck breast from your butcher. As for the carrot daikon pickle, Andrea's recipe has never failed me. After experimenting with the coarse vs. fine graters on my processor I definitely think coarse is better, and it retains its crunchy texture quite well. Thanks Bruce for elaborating your grilling process. I will take your advice and make sure I have a generous amount of the marinade when I get it together to make my sandwiches. Oh, just a note about pate. I like to use a simple relatively smooth chicken liver pate, french style. There's one my gourmet market sells that I like very much, and, honestly, it wouldn't occur to me to look for it in Chinatown. If you are willing to use a regular baguette or a mexican roll and make your own Asian style grilled meat a terrific and traditional banh mi can be made without the need for a Chinatown or even an Asian grocery. You know, what's somewhat ironic about this discussion of "Americanized" Banh Mi is the fact that I typically am a traditionalist when we do these cook-offs. No fluffy, trendy, chi-chi, "fusion" blends of an authentic dish ever creep into my thinking when I'm planning a dish. Yet this cook-off I've veered off the path, (albeit in my mind not too far), to test the waters of crafting a Banh Mi to suit my own tastes. And respectfully putting conventional wisdom aside for a moment, that was a really, really good sandwich. I'm a little more, (just a little), convinced that one can fudge a bit in the kitchen and still come up with something quite tasty. The next Banh Mi I'll be doing will also test the borders of tradition, but not too far. At least I don't think so. David, I have no doubt that your sandwich was delicious, it certainly looked so to me. The only reason I commented on it being an "Americanized" version is because you noted at the start of this topic that you'd never had bahn mi before. I find it helpful to understand the baseline before i veer away from it and thought you might too. Looking forward to yur next one. 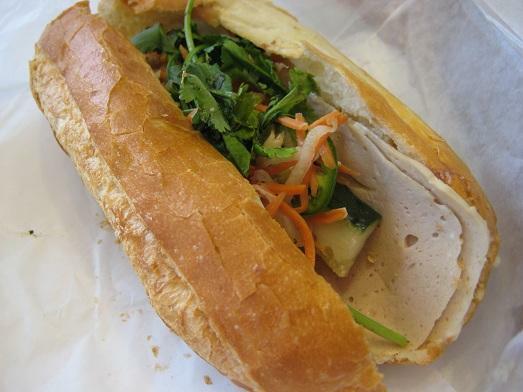 Most of the banh mi shops will sell their Pate and deli meats separately. When we used to live far from any supplier, we would just load up on all the ingredients except the bread, then get that from our local Fred Meyer's. Wow! Ill ask. guessing you live in a lucky place! Hmm, that's why it tastes more gamey... it's pork pate. As fate would have it, I found a Pho shop just blocks away from the Asian grocery store. I'm going to try a few of their Banh Mi on Friday and I'll report back as to whether or not I prefer their version over what I made at home. I think it will give me a better idea of the ratio of meat, veg and sauce/pate. 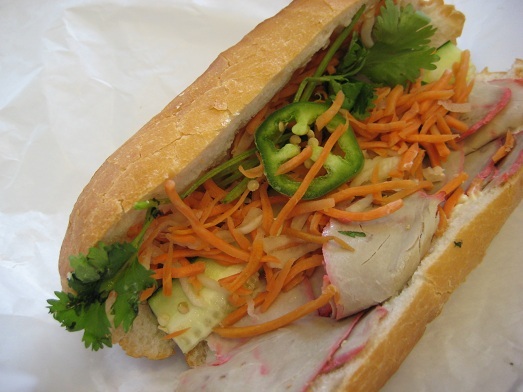 love to see pics of the Pho shop and their Banh Mi! Roberta, beautiful banh mi! I am very glad (and a little relieved) that you liked Vietnamese Kitchen. Cookbooks can be very personal, so I never know whether a book that works for me will work for others (although I was pretty confident in that recommendation). David, I look forward to your next banh mi, traditional or not. thanks for posting the video. Yes, it's always pork liver, and why most of us probably only want a light smear of it on our bahn mi. More than that and the gaminess and richness would overwhelm the other flavors. Long ago, once or twice I ordered my bahn mi sans pate, not being a fan of pork liver. Big mistake (aside from the look I got from the guy making the sandwich). The only analogy I can think of is from music--it tasted as if the bass note was missing against all those bright flavors. If that makes sense. Is the texture of the pork pate smooth yet firm, or is it more of the mousse consistency of the chicken liver spread I made? It's mousse consistency, or at least spreads very easily. No thick chunks or crumbly layers. My modest contributation to the thread - a couple of specimens (that I did not make, but that I wanted include for reference purposes). Maybe this will inspire me to try making my own version soon! I got the first one at a Vietnamese/French/Swedish bakery today (Sorrento European Bakery). For the meat, they had a few options that included pork with pate or bbq pork. They recommended the bbq pork so that's what I got. 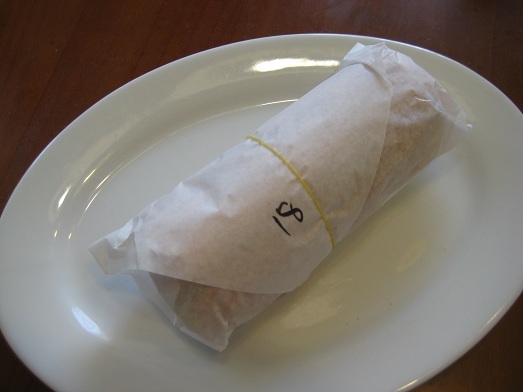 For some reason, the banh mi sandwiches always seem to be wrapped in the same manner- in paper with a little rubber band. Inside were all the traditional garnishes: carrots, cucumber, daikon, jalapeno, cilantro, spicy mayo. The verdict: meh. The thick skin on the cucumber was a turn off, and the vegetables hardly tasted pickled. There was no enough vinegar to offset the rich mayonnaise. But the meat was not bad and the baguette was crispy and warm. Also this was less than $4, a bargain. My current favorite is this twist on the traditional banh mi by MIHO, a local foodtruck. A little heavy on the mayo for me, but still very good. More expensive (about $8). Here's another southeast Louisiana Vietnamese poboy....can't remember the source, but it's fairly representative of the local ingredient-to-bread ratio and overall size of loaf. It had a thit nuong (grilled pork) filling. Oh, great. If FrogPrincesse and HungryC can post pictures of purchased banh mi, that means I'm going to have to go around and buy a bunch to remind myself which Nola banh mi is the best. Well, I thought that people without ready access to BMs might like to see what passes for "standard" in order to concoct their own riffs! I'm just happy to live in a place where I can get freshly baked banh mi loaves at 4 for $1.00. No kidding. What would life be like without "Vietnamese po boys?" I took the advice from our discussion and trekked out to a local Vietnamese Pho shop in search of a traditional Banh Mi from a Vietnamese kitchen. I immediately recognized the French roll, it came from the same Seattle bakery as the rolls I bought at the Asian grocery store down the street. It was warmed, the crust delicate and crispy, the interior dough soft and light. But the bread was one of the few saving graces that kept me from chucking out this Banh Mi. There were two thin shards of an undetectable, compressed, white meat. It was devoid of any flavor of either ham or pork. There was pork pate in the Banh Mi, about a teaspoon or so, smudged on one end of the bread. The carrot and daikon, (actually more carrot and a few threads of daikon), had no flavor, the cilantro was limp, and there was only one thin slice of jalapeno trying to boost the heat factor of the sandwich. The thick piece crisp, pickled cucumber was good, as was the rich homemade mayonnaise. 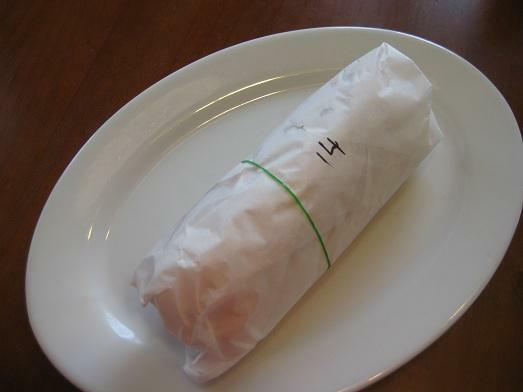 “#14” was a good “Cucumber, Mayonnaise Sandwich on a French Roll,” it just wasn’t a very good Banh Mi. Next up was the “18-Banh Mi Xa Xiu” billed as Barbecue Pork. The red-rimmed pork loin appeared to have come out of the supermarket deli case--about two weeks ago. It had more pork flavor than the “ham” in Banh Mi #14, but that’s not saying much since the ham tasted of nothing. Same shallow carrot/daikon “pickle” and limp cilantro. #18 could have used a boost, more than a teaspoon this time, from the pork pate. Good bread, same good mayonnaise and pickled cucumber, but a faint representative of what I think any of us would want in a Banh Mi. I’m glad I tried a restaurant-made Banh Mi. It adds to my understanding of what goes into the making of a Banh Mi, (and what to avoid), and now I have a better perspective of how to craft another Banh Mi at home. But having a better perspective doesn’t mean I have a clear perspective about this sandwich. In fact, after lunch today, I’m more tempted to craft Banh Mi at home to suit my own tastes while launching into a mission to find a better Banh Mi in a restaurant. Today’s trip wasn’t a lost affair. The price of the Banh Mi was only $2.75 each for a very large sandwich. Clearly in this case cost didn’t equate to either value or quality. The search is early on, but after today, I’d give the advantage to my roast pork Banh Mi over #14 and #18. I've never considered making Banh Mi at home, having access to top quality product within a dozen blocks of my home. For those within range, I heartily recommend "Little Saigon" shop on 6th Avenue between Clement and Geary Streets in San Francisco. 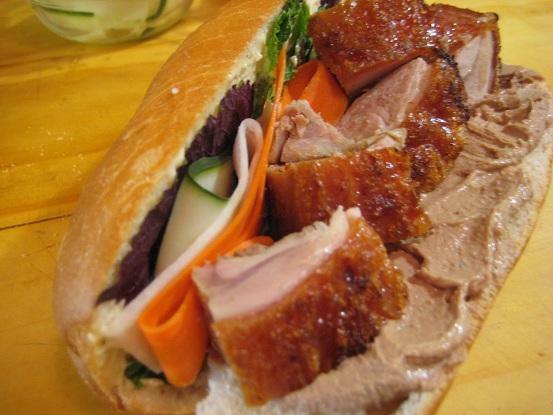 Classic sweet French roll, choice of pate, pressed ham, grilled chicken or pork, carrot and cucumber pickle, cilantro, mint, optional jalapeno, roll moistened with nuoc cham. This is our standard Saturday "running errands" pick up lunch. $4.50 for large sandwich. #14 and #18 look a little dry to me. at the B.M. shop i go to in Boston's Chinatown i ask for a little more pate and mayo on mine with extra green chili. I think also the only chance a B.M. can be considered authentic is that little rubber band! Yo, Margaret, wish I had something like that so close. But that's why a Banh Mi is such a great sandwich: you can make a very "authentic" and delicious one without having to go to Chinatown or even an Asian market. For those without easy access to Asian products, between hispanic markets, a deli and your favorite protein source, you could probably get what's needed. If you don't want to make some type of bbq pork, any grilled shrimp or chicken with an Asian flavor works well. Crispy pork or chicken skin is always a plus, but for friends who only eat seafood, quick sauteed marinated prawns cooked in a skillet make a very worthwhile Banh Mi. On the subject of authenticity....well, I just can't get too worked up about it. Creativity and cultural mash-up is the heart of this sandwich. As for bread, if you love those Viet rolls and they are easy to come by, by all means. I'm extremely happy with an Acme rustic baguette. I know people who sub the Mexican bolillos rolls. When it comes to the pate, recipes I've seen appear equally distributed between chicken liver and pork liver. I agree that a smooth spreadable pate works better in a Banh Mi than a chunky country-style, but franky I find a smooth chicken liver mousse to be more appealing than a smooth pork liver spread. If I were ever to make a more traditional chopped chicken liver spread I wouldn't be above trying a Bahn Mi with the leftovers. The deli I frequent sells a basic chicken liver mousse pate, and a truffled one. I did splurge once and use the truffled on a sandwich, but since the price is about double and there are so many strong flavors in the sandwich already it doesn't seem like an important upgrade. It was very good, though.